Andrés Neumann is a Creative and Culture Industry Professional, Design Thinker, Artistic Curator, Cultural Entrepreneur, Talent Coach, based in Rome (Italy). His experience in International Cultural Exchange spans almost half a century, and has marked the Performing Arts history of the 20th century. Among his main achievements are the coproduction of The Mahabharata by Peter Brook, the production of three pieces Pina Bausch created in two continents with the Tanztheater Wuppertal, as well as the international tour of The Dead Class by Tadeusz Kantor and the Cricot 2 from Krakow. Andrés Neumann’s professional Archive and Legacy, donated to the Funaro Cultural Center, Pistoia (Italy) is inventoried and studied by the Arts History and Performing Arts Department of the University of Florence (Italy). 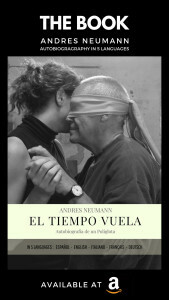 Andres Neumann has published his Autobiography. If you are curious you can read it on any device or in print in 5 languages.